Before a new season kicks off, we're forecasting the teams, players, coaches and stories that will dominate the fall. While some main characters have changed, the ultimate question remains the same: Who will make the final four? Alabama may have proved the majority of our experts’ preseason projections right by winning last year’s national championship, but the way the Crimson Tide pulled it off—surviving a selection committee controversy, turning to a true freshman quarterback and then clawing past an SEC foe that had the look of a team of destiny—couldn’t have been less predictable. As the fifth year of the College Football Playoff begins, the names of many favorites look familiar, but the paths they might take to the Orange Bowl and Cotton Bowl semifinals are as murky as ever. Who will be this year’s brightest stars and biggest goats? Who will stand atop a podium at Santa Clara’s Levi’s Stadium as national champions on Jan. 7? Below, SI’s college football experts make their playoff picks and reveal a few more predictions about the season ahead. 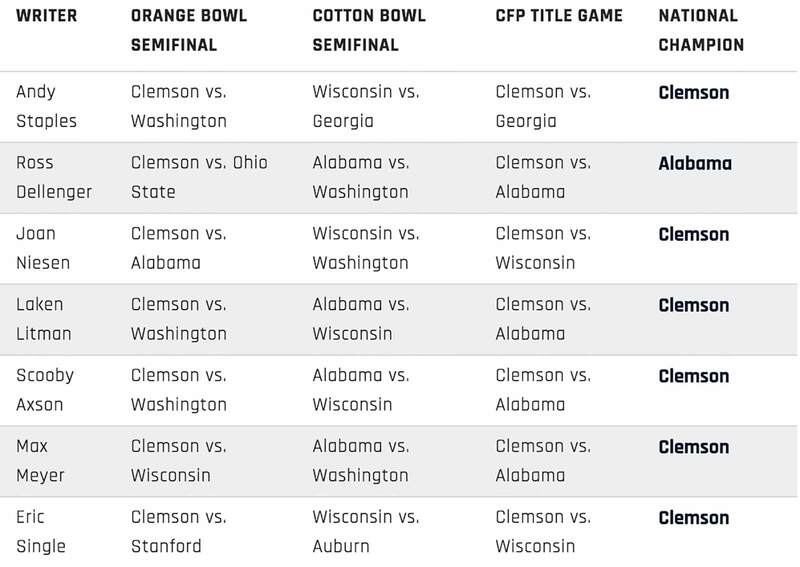 Andy Staples: I realize that Fred Segal, who runs the Old Takes Exposed Twitter account, has probably already marked this Alabama-less playoff field prediction so it can be roundly mocked come December. But we’re supposed to take some chances here, and it feels as if Kirby Smart’s Georgia will be a year-in, year-out contender for the SEC title. That said, I’m picking Clemson because the Tigers have an absolutely stacked roster. They’re going to get better quarterback play than last year because either Kelly Bryant will improve to fend off a challenge from true freshman Trevor Lawrence, or Lawrence will win the job. Ross Dellenger: From 2000 to ’07, the heart of Tiger Woods’s heyday, would you pick the field to win the Masters or Woods? Right. Nick Saban has Alabama cruising, winning five of the last nine titles, and the excitement around championship-game savior Tua Tagovailoa is palpable. The defense lost some studs, but they’ll restock like normal, and that schedule sets up nicely, too. Alabama will play eight games before seeing a team that finished in the final AP Top 25 last year. Joan Niesen: Clemson is the best team in college football this year, no matter which player ends up at quarterback in the long term. Its defensive line will not only be the best D-line in the game; it’ll be the best unit in all of college football, and in yet another Alabama matchup, it’ll have the upper hand in the Orange Bowl before shutting down a run-heavy Wisconsin offense in the title game. Laken Litman: First of all, Clemson has a terrifyingly dominant defensive line, bolstered by three stars that elected to return for another season instead of going to the NFL after helping the Tigers tie for the national lead in sacks (46); now all four starters could be selected in the first round next spring. Second, the Tigers have an exciting freshman quarterback in Lawrence who may become the starter by the end of September. And third, their schedule is quite favorable. Scooby Axson: At this point, neutrals must be sick of this matchup, but again these will be the two best teams in the country by early December. Conventional wisdom will tell you that the Tigers will fix the offensive woes that cratered their chances in last year’s playoff semifinal against the Tide; this time it will be Clemson’s turn to shut down an Alabama offense that so often wins on talent, setting up Dabo Swinney to hoist the trophy in Santa Clara. Max Meyer: Clemson has the most ferocious defensive line in recent college football history, and the offense returns starting QB Bryant (while bringing five-star freshman Lawrence into the fold) and a lethal RB duo in Travis Etienne and Tavien Feaster. Left tackle Mitch Hyatt and center Justin Falcinelli headline a strong offensive line. Yet, it will be the potentially transcendent defense that leads the Tigers to another national title. Eric Single: Let this be a challenge to the rest of the ACC: Almost everyone agrees that Clemson has the easiest path to the playoff of the national title contenders, making it the safest preseason pick to win it all. Something will go off script for the Tigers—maybe the late September date with Georgia Tech, or the Florida State trip sandwiched between home games against NC State and Louisville—but not so far off script that Swinney can’t right the ship. The big difference between this year’s team and 2017’s semifinalists is the cache of skill players ready to blossom, namely sophomore Tee Higgins and the running back tandem of sophomore Travis Etienne and junior Tavien Feaster. Staples: West Virginia QB Will Grier. If Grier stays healthy, he’ll post huge numbers in the Mountaineers’ offense. The defense should be better—not great, but better—which should allow West Virginia to win enough games to put Grier in position to win the award that in recent years has gone to the best quarterback or running back who plays for a team that wins at least nine games. Dellenger: Stanford RB Bryce Love. Love is the most known commodity in the 2018 race after finishing second to Baker Mayfield. This year, Love gets it done, and just think of all the great headline puns that will ensue. Eclipsing his 2017 total (2,118 rushing yards) will be tough, and he could afford to catch more passes (he had just six receptions for 33 yards last year), but Heisman voters love—pun!—a productive player who won’t tarnish his case off the field (the guy missed Pac-12 media days to attend class). And voters won’t crown a Heisman who’s part of a struggling team, so the Cardinal must win in the rough-and-tumble Pac-12 North. Niesen: Love. 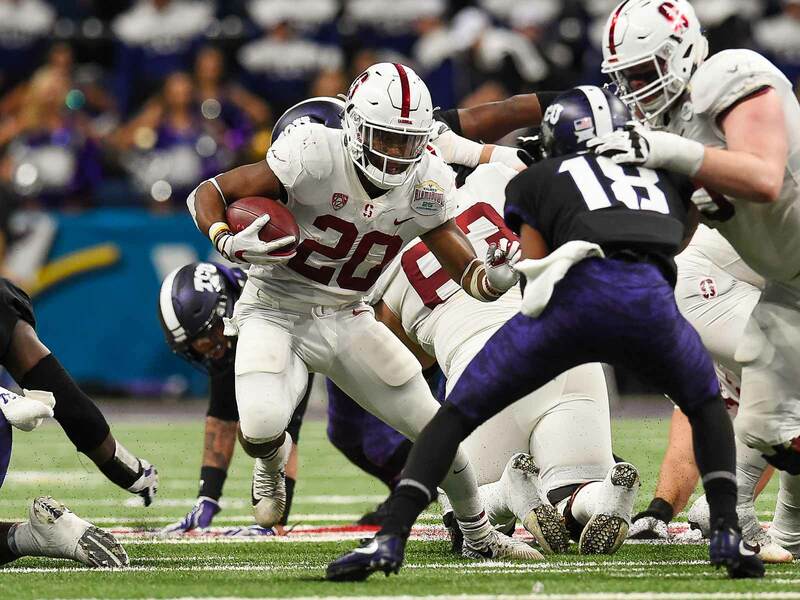 The Stanford running back, who returned to college football for academic reasons, will reap the athletic benefits. Love is primed to put up similar numbers to his 2017 totals on a better Stanford team that will make a New Year’s Six bowl game. The elevated platform for the Cardinal will help Love’s case, as will the lack of a Heisman-caliber quarterback on any of the playoff teams. Litman: Love. Last year no player came close to the explosiveness of Love, who led the country with 13 rushes of 50 yards or more and 8.1 yards per carry, both single-season FBS records. He racked up all those gaudy numbers while battling an ankle injury down the stretch, and with Mayfield out of the picture, he’s certainly the frontrunner this year. Axson: Alabama QB Tua Tagovailoa. Since the Heisman winner in seven of the last eight years has come from the quarterback position, it’s a safe bet that trend will continue. The odds-on favorite to win the award is Tagovailoa, who has started a grand total of zero games in his career. Don’t expect Tagovailoa to pile up a bunch of 300-yard games for the Tide, but he will be the best player on one of the best teams in the country, and with few other standout contender, he could easily make it to New York with a solid season. Meyer: Wisconsin RB Jonathan Taylor. A quarterback has won the Heisman in seven of the past eight years, but I’m going in a different direction. Taylor is the latest talented Wisconsin tailback who is fortunate enough to run behind a behemoth offensive line. In 2017, he racked up 1,977 yards on the ground and 13 rushing touchdowns on 299 carries (6.6 yards per carry) ... as a freshman. Let me repeat that last part for emphasis: as a freshman. With Wisconsin a smart bet to finish with double-digit winsas the class of the much-less-challenging Big Ten West, Taylor will have plenty of opportunities to gallop away with the national spotlight. Single: Penn State QB Trace McSorley. Everyone has focused on what the Nittany Lions are losing on offense, namely Saquon Barkley and Joe Moorhead. Those departures should only accentuate McSorley’s value as the dual-threat engine of a Big Ten contender that can cement itself in the playoff conversation with back-to-back home games against Ohio State and Michigan State in the first half of the season. Working with new offensive coordinator Ricky Rahne, whose playcalling debut in the Fiesta Bowl ended with a 32-of-41 night through the air and a seven-point win over Washington, McSorley should be as lethal as ever on keepers and just as quick to punish defenses with improvisation and pinpoint accuracy as 2017 winner Mayfield was. Which Power 5 team will be the biggest disappointment? Staples: USC. I was surprised when I saw how high the Trojans were ranked in the preseason polls, because there is so much unknown there. 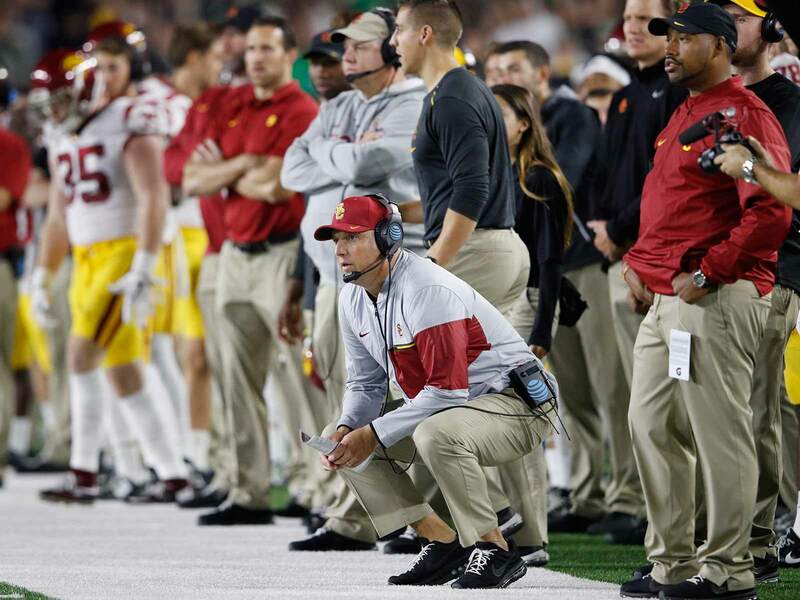 USC may wind up starting a true freshman quarterback (J.T. Daniels) who just arrived on campus this summer. The Trojans may wind up having the exact kind of season we should expect them to have given the circumstances, but with preseason expectations this high, that could feel like a disappointment. Dellenger: West Virginia. The hype around Morgantown is strong, and rightfully so, but we’re not completely buying the Mountaineers. They return one of the nation’s best passers in Will Grier, a Heisman Trophy contender, but the defense loses five starters from a unit that ranked 106th in the FBS last season in yards per game allowed (445.5). And have you seen that schedule? The Mountaineers play at Texas, Oklahoma State and Iowa State and host TCU, Oklahoma and Kansas State. They’ll drop at least one, if not two or three, over that stretch. Niesen: Arizona. What an easy way to immediately anger a fan base—sorry in advance, Wildcats fans. I think Arizona has so much upside behind Khalil Tate at quarterback, but it ultimately won’t be able to live up to expectations in year one under Kevin Sumlin. Visions of Johnny Manziel 2.0 are playing through fans’ imaginations, and no matter how good Tate is, Arizona’s defense won’t be able to hold up its end of the bargain. Even in a Pac-12 South that could produce a surprise champion, it won’t be Arizona. Litman: Michigan State. The Spartans could be poised for consecutive double-digit-win seasons, and they return quarterback Brian Lewerke, running back LJ Scott and a defense with 10 starters from a 2017 group that was the nation’s seventh-best. 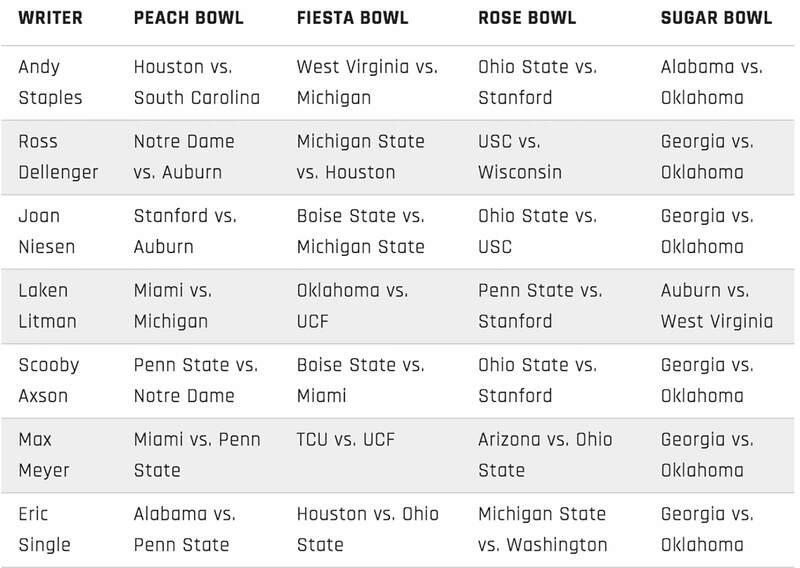 But for all its preseason hype and lofty starting ranking, Michigan State still has to play Michigan, Ohio State and Penn State, in addition to an early road test against Herm Edwards’s Arizona State. Axson: USC. The Trojans enter the season riding high off a Cotton Bowl appearance in 2017 and with enough talent to take a very winnable Pac-12 South once again. But last year’s conference title came with Sam Darnold at quarterback. There is no top-five 2019 NFL draft pick waiting in the wings, so growing pains are to be expected as USC transitions to the future. Road games at Stanford, Texas and Arizona in September could send this season off the rails in a hurry. Meyer: Auburn. The reigning SEC West champs face a major season-opening test against Washington at Mercedes-Benz Stadium in Atlanta. The Tigers also have to play Alabama and Georgia on the road in crucial November battles. Good luck reaching double-digit wins again while replacing four seniors on the offensive line along with last season’s leading rushing Kerryon Johnson, now with the Lions. Jarrett Stidham is an intriguing draft prospect, but he can only do so much under center with this much turnover. Single: Michigan. I actually think the Wolverines are going to beat Notre Dame on Sept. 1, but that might only ratchet up expectations in Ann Arbor to a place where they absolutely need to show significant improvement in conference play or else brace for an unpleasant offseason. 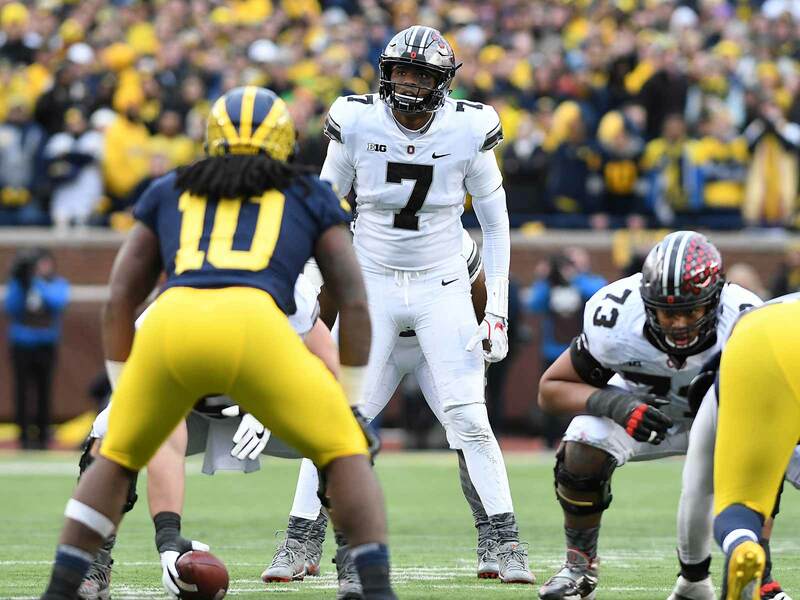 Their midseason stretch of hosting Wisconsin, traveling to Michigan State and then playing Penn State at home after a bye is arguably the toughest three-game set on any Big Ten East favorite’s plate, and losing two of those three would risk making the Ohio State game irrelevant. The defense should be excellent again, but after some inconsistent showings against top SEC competition at Ole Miss, new quarterback Shea Patterson can’t have many bad days. Which under-the-radar team will emerge as a surprise playoff contender? Staples: The radar sweeps pretty far this year. For example, there are five teams in the Big Ten (Michigan, Michigan State, Ohio State, Penn State, Wisconsin) who could make the playoff without surprising us at all. But one team we haven’t talked about much as a playoff possibility—but absolutely has a potential path to the playoff—is Stanford. The Cardinal have Bryce Love, a good offensive line and two capable quarterbacks (K.J. Costello and Davis Mills). If they’re decent on defense, they absolutely could win the Pac-12 North and the Pac-12 and be in the mix for the playoff. Dellenger: Houston. Could the Cougars go undefeated, and if they do, will they get a shot in the playoff? 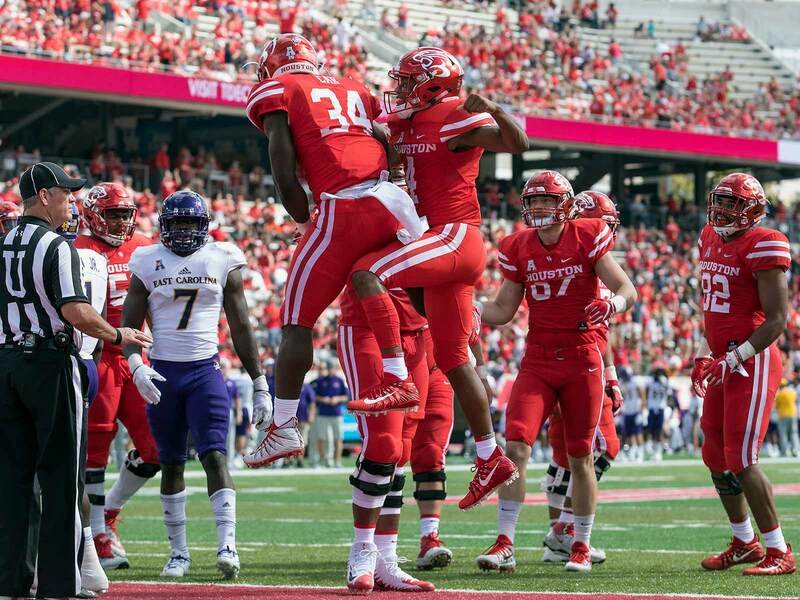 Anchored by first-round talent Ed Oliver, Houston gets a chance to show its worth with a pair of early-season games against Power 5 teams Arizona (at home) and Texas Tech (in Lubbock). No, those are not juggernauts, and that’s why wins are a must if UH wants to have a chance at the CFP. It’s a stretch, we know, but Oliver and the Cougars would at least give the committee something to think about if they ran the table. Niesen: TCU. The Horned Frogs have lived in the shadow of Oklahoma and Baker Mayfield in recent seasons, but with the conference’s best quarterback off to the NFL, 2018 might be the year the Horned Frogs win a Big 12 title outright. (They split one with Baylor in the championship game-less 2014 season.) Sophomore quarterback Shawn Robinson will start, and in a small sample size thus far, he’s been good. Moreover, his presence is something of a benchmark for TCU. In 2016, Robinson was the first four-star recruit ever to sign with the Horned Frogs to play quarterback. If he can be consistent and the offensive skill positions can produce like we expect them to, TCU should contend; after all, it’s one of the few Big 12 programs with a very good defense. Litman: West Virginia. The Mountaineers’ offense will feature one of the nation’s most exciting duos in quarterback Will Grier (who set a school record for nine 300-yard passing games in 2017) and wide receiver David Sills V (who tied for the FBS lead in touchdown catches last season with 18). But making it to the College Football Playoff may hinge on a turning around a defense that ranked among the worst in the FBS last season—and beating Oklahoma at home in primetime on the final weekend of the regular season. Axson: West Virginia. Eight offensive starters return from a group that averaged 460 yards a game and 34.5 points a game last season. The question for the Mountaineers is how smoothly that experienced core can navigate a manageable Big 12 schedule and a non-conference slate that features Tennessee and NC State. Keeping Grier healthy will also go a long way towards realizing West Virginia’s elusive conference title hopes. Meyer: Arizona. As Gordon Gekko famously said in Wall Street, “Blue Horseshoe loves Khalil Tate.” Or something like that. Arizona’s electric dual-threat signal-caller lit the college football world on fire last year, tearing apart Pac-12 defenses week after week. The Wildcats hired quarterback whisperer Kevin Sumlin as their new head coach, and that should help boost Tate’s potential through the air. Between Tate and junior tailback J.J. Taylor, Arizona could have the most dangerous backfield in the country. The Wildcats were also gifted an incredible schedule: They avoid Washington and Stanford, and they get USC and Oregon in Tucson. Don’t be surprised to see Arizona flirt with 10 wins. Single: NC State. If the Wolfpack beat West Virginia in Raleigh on Sept. 15, they should be favored in every game on the schedule save for the Oct. 20 trip to Clemson, and even the three-time defending ACC champs have had trouble putting away Dave Doeren’s teams. Quarterback Ryan Finley, he of the ACC’s longest streak of passes without an interception since Russell Wilson, has an exciting set of targets to take teams vertical, and while the defense has some big holes to fill in terms of returning starters, the 2018 unit is loaded with juniors and seniors. Would they be able to rack up enough style points outside the Clemson game to sneak in as the ACC’s second playoff team? Now the reality check: NC State hasn’t won double-digit games since Philip Rivers’s prime. Which coach will be on the hottest seat by midseason? Staples: Kansas coach David Beaty is on the hottest seat now. The question is if he can make it to midseason. 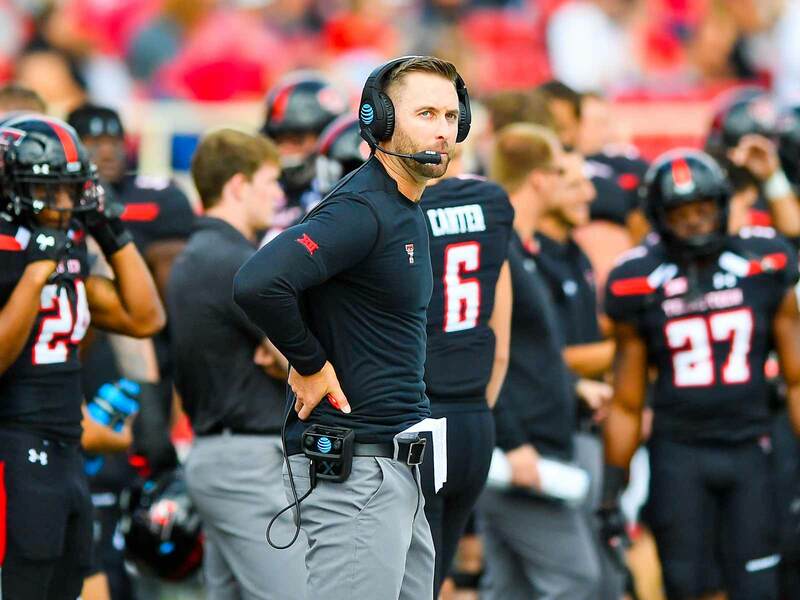 Staying in the Big 12, Kliff Kingsbury could be in trouble if the Red Raiders start slow. They have Ole Miss and Houston in the non-conference, and they open Big 12 play at Oklahoma State followed by a visit from West Virginia and a Thursday night game at TCU. Dellenger: Kingsbury has won 16 of his 45 Big 12 games at Texas Tech, including 3–6 conference records in each of the last two years. The university brought back its dapper former record-setting quarterback with much fanfare in 2013, but on the field, it’s been ugly. He enters his sixth year in charge in Lubbock needing to break out of the lower half of the Big 12, and that’s only a possibility if the defense can hold opponents to less than 200 yards rushing a game, something they’ve done just once in Kingsbury’s five seasons. Niesen: I’d rather bet on the guy I think will be out by the end of the season—that’s Beaty at Kansas—but I don’t see the Jayhawks making a move midseason or even expressing much shock if things go poorly. It’s not like there are big expectations to meet or miss. A name I’d watch in October, then, is North Carolina’s Larry Fedora. The Tar Heels put up a 3–9 record last year, and the year before that, a talented roster was only able to go 8–5. Should North Carolina look like it doesn’t have a chance in a couple of games before midseason, Fedora could be feeling the heat. Litman: Fedora has already been part of controversy this summer for his viral comments at ACC media days and then again when 13 North Carolina football players were suspended for selling team-issued shoes. He doesn’t have much room for error, and the Tar Heels don’t have an easy schedule. After two road games to start, UNC opens at home against unofficial reigning national champions UCF. They’ll conclude a tough September with another road trip to defending Coastal Division champ Miami. Axson: Ed Orgeron. It seems that LSU finds itself in this position almost every season: the product on the field doesn’t live up to the talent that is recruited and fans grow tired of an inconsistent offense, leading to a head coach in danger of losing his job. LSU hasn’t won an SEC title since 2011 and boosters will have no trouble paying Orgeron’s buyout if the Tigers slip up and don’t meet expectations. Meyer: LSU doesn’t have a lot of easy wins on its schedule, and that doesn’t bode well for Ed Orgeron. It’s easy to envision the Tigers with a losing record in the middle of October—in their first seven games, they face Miami on a neutral field, host Georgia and travel to Auburn and Florida. Ohio State graduate transfer QB Joe Burrow showed encouraging signs in his limited playing time with the Buckeyes. Yet even with him competing for the starting gig, LSU still has uncertainty at quarterback, mere days out from the season. Single: Kingsbury skated by last year’s firing cycle with help from an upset win over Texas on Black Friday, but if the Red Raiders lose to either Ole Miss or Houston and can’t give Oklahoma State and West Virginia a four-quarter game, he could be in for a long and restless bye week in early October. Who will be the fall’s biggest breakout player? Staples: Ohio State QB Dwayne Haskins. The Buckeyes’ offense in the Haskins era should look very different from the J.T. Barrett era. Ohio State should be able to stretch the field more vertically, and the fact that Haskins isn’t going to be relied upon to power the run game means backs J.K. Dobbins and Mike Weber should get more action. If this sounds like the tail end of the 2014 season with Cardale Jones at quarterback and Ezekiel Elliott as the engine, then you know why everyone in Columbus is so excited about Haskins. Dellenger: Missouri quarterback Drew Lock. He is getting his share of offseason attention, but Lock isn’t too high on any Heisman Trophy lists, and maybe that’s because the Tigers aren’t in a position to contend for a championship. A strong year from Lock could put them in that very position and set up the QB for Heisman contention in November. The Tigers have a shot to get off to a 3–0 start before a home game against division favorite Georgia provides a measuring stick for Lock and his team. Niesen: Haskins. I’m going with Haskins, who will offer a new look for the Buckeyes’ offense. He’s an athletic pro-style quarterback who attempted 57 passes a year ago, completing 40 of them for 565 yards. With Ohio State’s receiving corps plus running back J.K. Dobbins at his disposal, Haskins will have plenty of weapons, and he’ll be playing on college football’s premier stage, fighting for a Big Ten title in one of the game’s toughest divisions. Litman: Wisconsin RB Jonathan Taylor. Taylor broke Adrian Peterson’s NCAA freshman rushing record last season with 1,977 yards on 6.6 yards per carry, plus 13 touchdowns. He still finished just sixth in Heisman Trophy voting and with Wisconsin no longer sneaking up on opponents, it will be exciting to watch him race frontrunner Bryce Love to 2,000 rushing yards this season. Axson: Georgia RB D’Andre Swift. Expect Swift, at a compact but explosive 5'9" and 215 pounds, to get the majority of the running back touches now that Sony Michel and Nick Chubb are in the NFL. Swift ran for over 600 yards last season in limited action and is a home run threat each time he carries the ball. Swift can also be a factor in the screen game for the Bulldogs and a reliable security blanket for Jake Fromm, who will look to improve on his own impressive freshman campaign. Meyer: USC RB Stephen Carr. Get ready to start the Carr in Los Angeles. Stephen Carr flashed immense potential when he got early work as a true freshman, accumulating 188 rushing yards and two touchdowns on 18 carries in USC’s first two games against Western Michigan and Stanford. Then the injuries hit, and he only had 18 carries in the Trojans’ final 10 games. But with Ronald Jones II gone pro, Carr is the lead dog in a backfield that will give him ample opportunity to pile up numbers. His speed makes him a threat to break free on any play. Eric Single: Oklahoma QB Kyler Murray. Murray’s decision to play only the upcoming season for Oklahoma before beginning his professional baseball career seems to have slowed the hype surrounding his assumption of the starting duties in Norman, so get ready to be blown away by what he can do in a limited timeframe (as long as he beats out Austin Kendall for QB1 honors, of course). He can’t possibly be as accurate as Baker Mayfield was, but his mobility will stress defenses in a different way than Mayfield’s did.